The kit from Adventure Capital — sweet as! For those of us Kiwis (and non-Kiwis) dreaming of pitching a tent and soaking up all the great outdoors has to offer, but lacking in the equipment to turn the dream into a reality, Adventure Capital has given us an easy solution. My friends and I plan numerous camping trips every summer but very rarely do we make these trips happen. Who has a tent? Can we borrow an air mattress? Does the campground have barbecues or do we know anyone with a portable gas stove? I didn't grow up in a camping family and so don't have the garage full of gear passed down from my parents. And what of the wonderful and numerous explorers of our country, flocking from around the globe and wanting to experience the beauty that is New Zealand first hand? Do they bring camping gear with them? Hardly, considering New Zealand is as far as you can get from anywhere… Moreover, New Zealand's strict quarantine laws are prohibitive for would-be campers bringing their own equipment. Adventure Capital hires camping packages (among other things) out to said intrepid travellers with a range of size options to suit every circumstance. Rates start from just $25 a day — the two-person car camping kit we took hires out at $29 per day. So, armed with our car camping package, Chris and I set off across the Hauraki Gulf at the crack of dawn one April Saturday morning to beautiful Waiheke Island for a relaxing weekend in the outdoors. First hurdle: being functional so early on a weekend morning. Thanks to the friendly staff at SeaLink (Auckland to Waiheke ferry operator) and the delicious coffee available at Wynyard Quarter, the mood was lifted and excitement crept in. The ease of simply driving onto the ferry, reading the newspaper for an hour, and driving off at the other end was a great precursor to the weekend ahead. Second hurdle: Chris asks, "Do you know how we get to Whakanewha Campground?" I reply, "Nope. Look for signs to Rocky Bay." And away we went. Crisis averted. We followed the main track until we hit a sign for Rocky Bay, where Waiheke's only campground is situated. There may or may not have been one wrong turn involved along the way but all in all, it took us approximately ten minutes from disembarking the ferry to arriving at the campground. What a beautiful, wee campground it is. Set in the Whakanewha Regional Park on the shores of Rocky Bay, this campground is actually pretty large in relation to the size of the island. It's pretty and well laid out, divided into sections by trees and foliage for a feeling of privacy. It also hits a nice balance between rugged and civilised. While there are two large gas barbecues for use, there is only a cold, outdoor shower — a great substitute for your morning coffee! But one feature I definitely approved of was the automatic light sensors in the bathrooms after dark. We lucked out as the campground was almost empty at the time of our stay. A nice young family, a group of mid-twenties 'hippies' and a few couples with outdoor experience levels ranging from (what appeared to be) zero to Bear Grylls. Third hurdle: setting up what looked like the biggest tent I'd ever seen, before the sun went down in approximately ten hours. Here's where the magic happens. 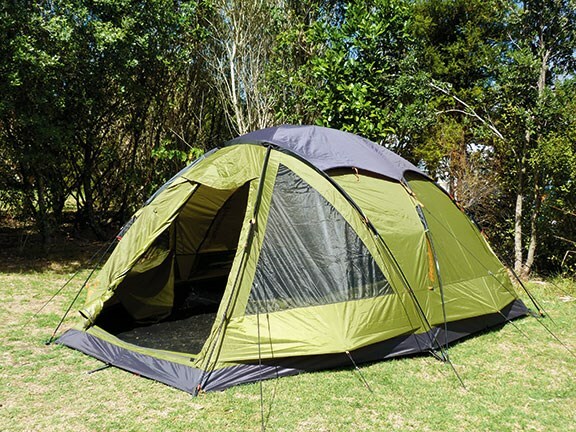 A big, luxurious, three-person dome tent (we opted for a larger tent than usual in the package), on par with the size of a small inner-city apartment, was erected perfectly in less than ten minutes, the sweat on the brow only forming due to the high summer temperature. The secret to such success? 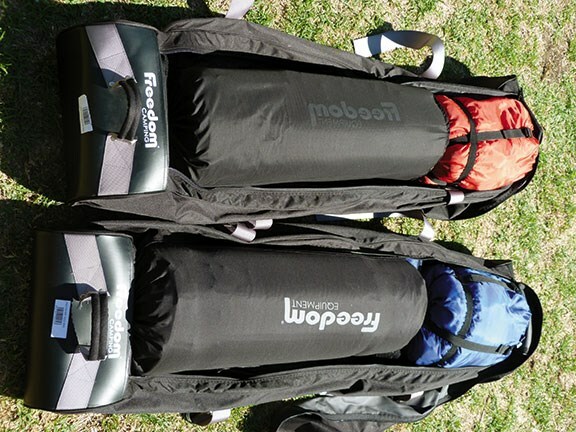 Adventure Capital had enough nous to colour-code each tent pole with the corresponding insert. It's actually pretty sensible but I was left marvelling at the genius of it. This small consideration means anyone not able to read English can set up this tent with ease. Brilliant. The camping kit was truly amazing — huge tent, two self-inflating sleeping mats, two sleeping bags and two pillows (all carried in two handy, hi-tech duffle bags); a gas stove, gas bottle, plates, mugs, cups, utensils, barbecue tools, pots, a fry pan, chopping board, cooler bag, ice pack and two tea towels all packed into a handy tub doubling as a wash-up bucket. The only thing we added was dish soap and a sponge. It was like Christmas morning as we unpacked it all, and subsequently every meal was fun to cook and tasted that much better. Time to explore the island… Starting close to home, there are a range of bushwalks winding through Whakanewha Regional Park, including a 40-minute loop walk leaving from the campground to the Maori pa, giving stunning views over Rocky Bay to Auckland. For those of you who are fishing buffs, there are some fine-looking rocks at the edges of Rocky Bay for you to cast a line off. Failing that, you can dig for pipis at low tide. The children in the party camping near us entertained themselves for hours doing just this. 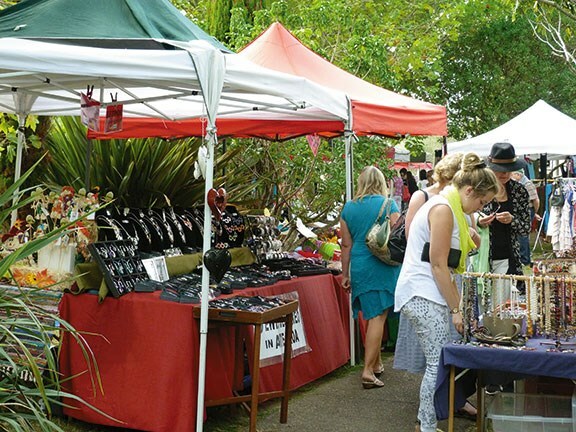 But if you want to leave the campground and go exploring all over the island, there are myriad things to do and see. 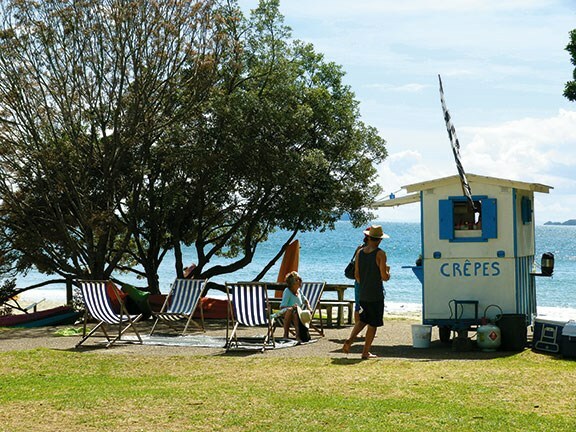 For the tamer thrill seeker, beachfront cafes are dotted around the coast (we chose Onetangi for lunch and then later visited Palm Beach for authentic fresh crepes by the seaside) to the famous vineyards and wine trails, there is something to suit everyone. The Connells Bay Sculpture Park (detailed in an earlier issue of MCD) is well worth a visit, as is the Wetland Garden at Wharetane Bay. Upping the adrenaline, there's everything from diving to charters to sea kayaking to paddle boarding to golfing to shooting and archery offered on this fabulous little (but quite spread out) island, just an hour by vehicular ferry from New Zealand's largest city. If you're feeling super adventurous, you could always take a ride on the flying fox zipline offered by Ecozip Adventures. Go on, I dare you! After a long day exploring, it was nice to know everything was there and ready to go upon returning to our campsite, tummies rumbling. The best part of the evening, though? The absolutely breath-taking sunset over Rocky Bay. It was truly a remarkable sight at the end of a fantastic day. Breaking camp the following day was just as easy as the set up. 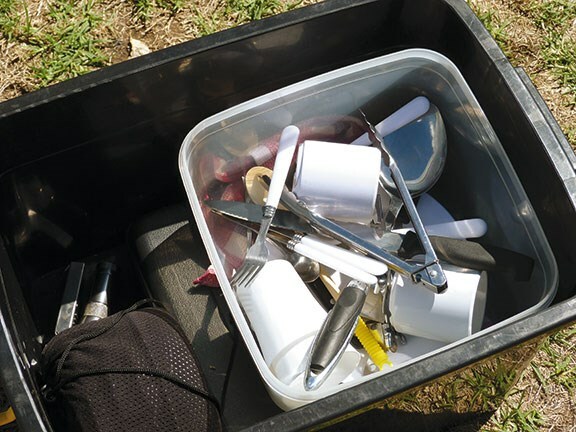 The fuss of getting things perfectly packed away is eliminated as Adventure Capital takes all used gear and fully services it before hiring it out again. I'll admit Chris did have to firmly remind me that two hours spent removing every blade of grass from the tent was completely unnecessary as clean-up is all part of the package. The return ferry trip was the exact reverse of the first one, just as simple, just as relaxing. It's a good thing too, as the last thing you want at the end of a break away is to be jolted back to reality with a stressful return journey. 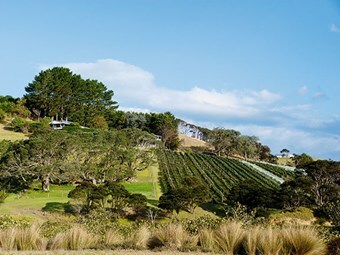 Waiheke Island is a must-do camping trip with its easy access, wonderful campground and range of activities to suit every kind of holidaymaker. Wondering how to go about collecting enough camping gear to see you through? Visit the Adventure Capital website for quick, easy options. And then just go. 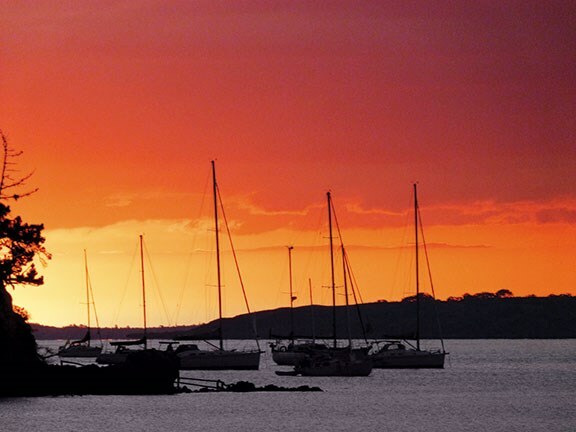 SeaLink is your go-to for travel between Auckland and Waiheke Island. You can either travel as a foot passenger or take your automobile of choice with you. As daily commuting between the island and city is popular with residents from both places, SeaLink offers a comprehensive timetable from Monday to Sunday with the option of concession passes to keep the cost down. There is also the option of boarding or stepping off the ferry in either downtown Auckland City or Half Moon Bay, about 20km or half an hour's drive south east of the city. A return trip for a car and two people starts at $120, departing from Half Moon Bay. Just turn up half an hour before departure and you'll be good to go. 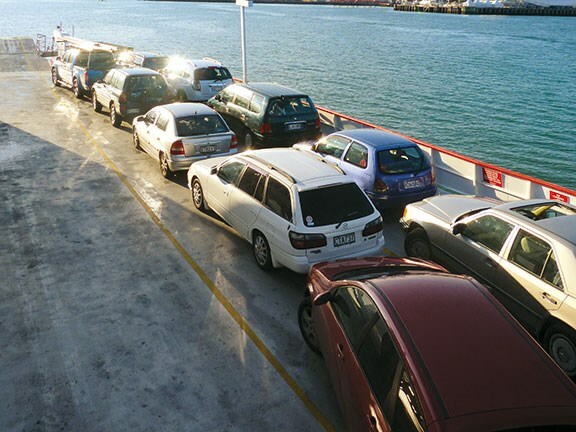 If you do decide to travel to Waiheke as a foot passenger, SeaLink has recently signed an agreement with Waiheke Executive Transport to provide a winter shuttle service on the island side. SeaLink will change to its winter timetable on 4 June so be sure to visit its website for the latest updates on all travel services.